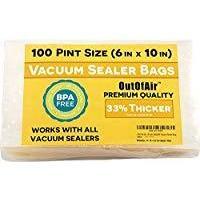 Commercial Grade Vacuum Sealer Bags are bags that are thicker and more durable than Generic Vacuum Sealer Bags. While there is no industry controlled standard for a bag to be called "Commercial Grade", the generally accepted specifications are that a bag have a front thickness of at least 4 Mil and have a back thickness of at least 10 Mil. The thickest bags we reviewed were from CaseKix and had a thickness of 4 Mil and 12 Mil. While you could use those bags for everyday use they aren't the most economical choice. 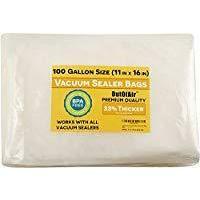 Our top recommendation for is OutOfAir Vacuum Sealer Bags they are high quality, durable and are available at a great price. 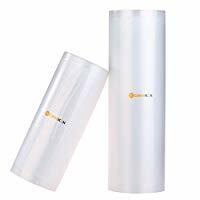 If you're looking for regular vacuum sealers try our Generic Vacuum Sealer Bag Reviews page. 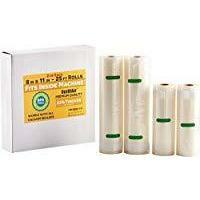 You can our complete list of reviews on our Vacuum Sealer Bags Reviews page. $19.99 - $0.3 Per Sq. Ft.
$26.99 - $0.29 Per Sq. Ft.
$23.99 - $0.62 Per Sq. 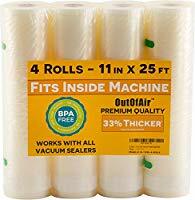 Ft.
$24.9 - $0.32 Per Sq. 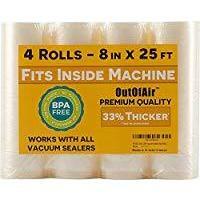 Ft.
OutOfAir Vacuum Sealer Bags and Rolls were our highest rated vacuum sealer bags. They are universal and work in most vacuum sealing machines, are high quality, and available at a great price. The Weston Pro Advantage is a professional grade vacuum sealer that you can have in your kitchen today. 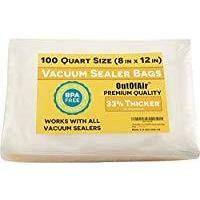 It's one of the highest quality vacuum sealers we reviewed and is available at a great price.